Eight FM employees show children and adults how math is relevant to cleaning, masonry, and other FM fields at our nation’s first ever National Math Festival. On April 18, 2015, the Smithsonian Office of Facilities Management and Reliability contributed three exhibits to the first ever National Math Festival, which took place on the National Mall from 10:00 am to 4:00 pm. The Festival included more than seventy interactive math exhibits, lectures, and games designed for individuals of all math backgrounds and ages, and it attracted over 20,000 visitors according to the National Math Festival website. 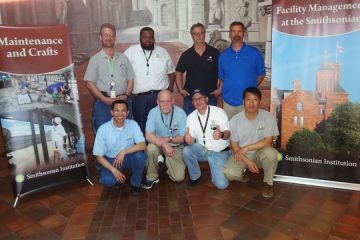 Eight employees– Scottie Benjamin, Abe Elbakkari , Steve Ganun, Yong Kim , Scott Lyon, Maverick Parker, John Trigger, and Nhan Truong–created and staffed the exhibits, which incorporated math concepts of varying complexity and shed light on the Smithsonian’s behind- the- scenes work. “Clean Math” educated visitors about environmentally friendly “green cleaning” products, and it challenged young children to think about how custodial staff use knowledge of ratios every day to mix cleaning chemicals properly. Children used bins of colored water to mix their own pretend green cleaning chemicals. Several teachers requested materials from the exhibit for their classrooms because they were “fascinated that there would be math in [cleaning]”said Maverick Parker, a Facilities Service Supervisor who staffed the exhibit. The exhibit also contained math problems that asked visitors to calculate how much toilet paper a manager must order every year to meet the Smithsonian’s demand. Though the problems were intended to serve as an individual activity, they soon served as impromptu competition questions when parents encouraged their children to find the correct answers before the other children. In the “Comfortable Math, Comfortable Spaces” exhibit, visitors considered how relative air temperatures and other factors must be considered to keep the Smithsonian at a temperature that is suitable for both museum visitors and sensitive artifacts. The exhibit explained Psychrometry, a field of engineering that enables professionals to control HVAC–heating, ventilation, and air conditioning. They learned how to read a Psychometric Chart, a tool that explains “the relationship between sensible temperature and %RH (relative humidity)” according to Yong Kim, a mechanical engineer who staffed the exhibit. “I was way busier than I anticipated. I did not think that many people were interested in HVAC control” said Kim, who handed out 250 Psychrometric Charts during the exhibit to a varied audience that included parents, a PHD Mathematics student, and middle school math teachers. 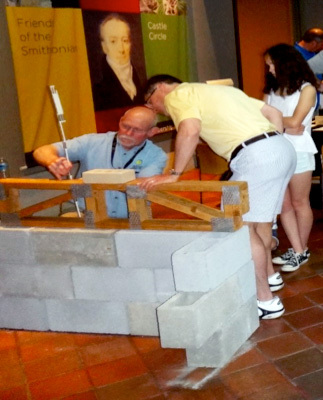 “Math of Built Structures” allowed visitors to physically build a masonry wall and demonstrated the idea that multiplication and division are necessary to know how many materials one needs to build a wall of a given size. Some visitors chatted with structural engineer Marvin Strzyzewski from MiTek and learned how engineers find answers to important questions such as how much accumulated snowfall a roof can handle. John Trigger, a mason who staffed the “Math of Built Structures Exhibit”, shared his experiences with math in response to children who complained about the subject. John Trigger shows visitors how to gather measurements needed to build a wall. “Well, they were saying ‘why do I have to do math?’ And I told them, when I was in school–high school– geometry was the worst subject of my life, and I never would use it. And I told them the importance of math. You know, you may not think you’re gonna use it, but you’re gonna use it every day, and that’s what we do here,” Trigger explained. Visitors took home pamphlets which had fun facts, general information, and math problems from the exhibit.